“Plan bumper harvests the no-dig way – Charles Dowding’s Veg Journal provides simple steps, experienced advice and seasonal checklists to plan a year’s veg growing. The information is taken from the author’s successful Charles Dowding Vegetable Course and is arranged in a useful monthly journal so that no activity is overlooked and readers can follow his mantra of ‘little and often’. leave a reply/comment to this post saying that you wish to enter and (if you don’t do so already) follow ‘The Anxious Gardener.’ Erm … and that’s it! Easy, huh? The closing date is midnight on Friday 7th February 2014. I shall draw the winner out of my rather disreputable, mowing Panama and notify the winner by email. Sorry to say that you must be a UK resident to enter (or at least have a UK postal address to which the book can be posted). 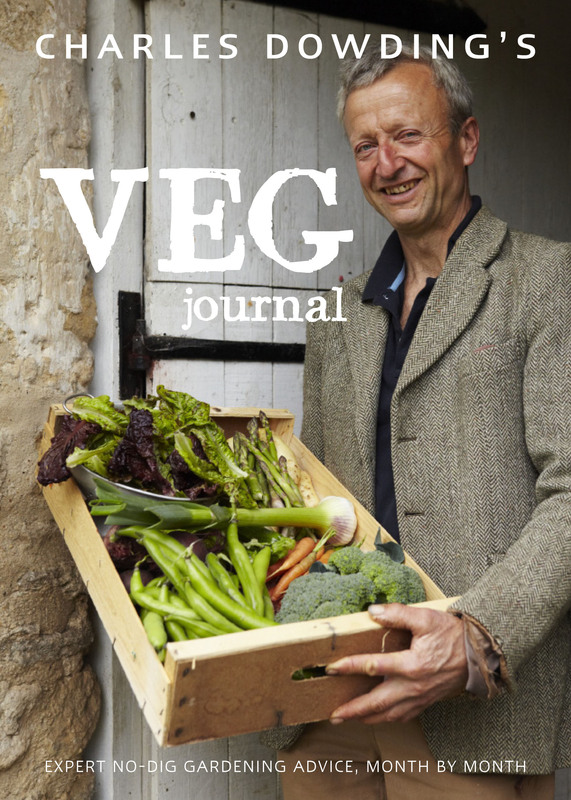 To order Charles Dowding’s Veg Journal at the discounted price of £12.00 including p&p* (RRP: £14.99), telephone 01903 828503 or email mailorders@lbsltd.co.uk and quote the offer code APG69. This competition is now closed. Thanks to everyone for entering. And the winner is … Ros Forge. Congratulations! Great prize thank you. Please enter me. Please enter me for this competition, it’s a super prize. I’d like to enter thanks! Please enter me for this competition, it’s a great prize. Please enter me, would love to be more organised and productive with my vegetables! I would love to enter the competition please! I would love to win this. My husband wants to grow veg but his disability means that digging is impossible. This book looks fabulous and is just what I need for my third year of growing veg (I’m still very new to this!) Please enter me into the giveaway. Thank you. Please enter me too 🙂 I’m a skint student and need to improve my terrible gardening so I can make some stews this year. would so love this! got my plot ready but this beginner needs all the help i can get, looking at buying some seeds next but not a clue where to start! Please enter me into the draw. I would love to winit. Wonderful prize. Please enter my name into the competition. Thank you. Please enter me into the competition, I could really use this book to help me establish my veg plot. Love your blog! As a fan of Charles Dowding this would be the next best thing to going on one of his courses – Cambridge to Devon is quite a trek! It would help us enormously to get the most out of our ‘productive’ vegetable plot! I would love to win please. I always forget what I should be planting when so this would be a great help! Would love to enter please? Lovely prize! Have put my name down for an allotment as theres no more room in my garden for fruit trees, so this book would come in really handy! Need a veg book hoe, hoe, hoe! Veg will make me grow, grow,grow! Would bring me so much happiness that my cheeks would be aglow!!! Please enter me 🙂 Last year was quite the vegetable failure for me! Please enter me ! I need inspiration ! I’d like to read this book – and indulge in crumpets. I’d like to enter! Waiting for the wind to die down so I can get digging! I would love to win this (follow you). I am a chaotic, reluctant gardener and have so many disasters under my belt which make me lose confidence, not helped by the dog who digs life threatening craters on my veg plot!. Can’t decide if I love or hate gardening but so want to be more self-sufficient but I need my hand holding and it sounds like your veg journal would help. Would love to win a copy of your book – sounds excellent. We are just waiting for our proposed veg patch to stop resembling a lake! Please put my name in your hat too. Yes please. I’d love to win a copy of his book. I am such a huge fan of his system (although I don’t think I’ve ever actually managed to implement fully) and I’d love to read about it in more detail. Oh, lots of pooh, David, me not being a UK resident and stuff. To be honest, first of all, your new header is amazing. like everything you do, really beautiful. And second honest is I’m not really a productive gardener type of person. Please enter me in your draw and save my back. I planted my garlic 2 weeks ago and it’s up already, there’s not a moment to waste, the summer is just around the corner and we’ll be short of water. Put my name in your panama hat please, the book might give me some new ideas,even if it doesn’t increase the area of my garden. Oh ye, please bung my name in the gardening wellies please! Anything to avoid digging clay….. I would like my name to go into the panama please! Yes please, I need someone to organise me, when to sow, plant and harvest all my veg. I grew hardly anything last year and need some inspiration! yes please – look at the size of his broccoli! Great idea – I would be really interested to read the sections on coriander, compost and slugs. Please add me to your hat. I was just thinking about planting my potatoes so I’d love to find out the correct way to do it. I’m delighted I can find my way into your hat without having to say something witty or make up the best catch phrase. I’m a keen ‘no dig’ advocate and month by month is the best way to follow a veg book, please toss me in your panama but I’ll let my SIL have the book, should I win as she’s just started an allotment and needs all the help she can get. We constructed our first raised bed last year – and it’s still waiting to be filled! So this sounds like the perfect book to get us started. Please pop my name in your disreputable mowing Panama. I tried no dig on my last allotment, based on an article by Charles in Amateur Gardening magazine. Worked really well and would love this book to help me with my new allotment! Already follow the blog and look forward to the next post. Please chuck my name in the hat. I’m sorry it’s been so wet and dreary over there. I have a friend in Godalming (which I know isn’t all that close to you, but from here you look like neighbors) who’s had some mighty choice Words to say about the weather. Hope you get some better gardening days soon — or have a good stock of crumpets on standby. “Expert mulcher and weeder” sounds like a wonderful thing to put on a CV. do all of the above and then give up the day and become a comedian. Prepare to be tumbled, William.